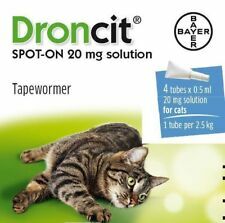 Droncit Spot-On Tubes for Cats - 4 - 0.5 Ml. For the treatment of tapeworms in cats. It is effective against mature and immature forms of dipylidium caninum and taenia species. The product is also effective against echinococcus multilocularis. Legal Category: AVM-GSL. .
Johnson's Cod Liver Tablets for Cats and Dogs 40 Capsules (Posted Today if Paid Before 2pm) Natural dietary supplement & conditioner, Promotes healthy coat, skin & bone. 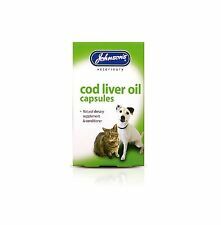 Cod Liver Oil is a natural dietary supplement rich in polyunsaturates & Vitimans A, D & E. Give regulary to promote and maintain good condition, glossy coat, healthy skin, fur and feather, strong bones and teeth and resistance to ailments, Also used as a traditional aid to help maintain supple and flexible joints. Although they have been used for many years, they have not been subjected to clinical trials, so therefore the evidence for their prophylactic use can not be substantiated. Then one pillule weekly for six weeks. PlaqueOff®Dental Bites Works systemically against bad breath, tartar & plaque Suitable for cats and dogs Same ingredients as PlaqueOff® Powder – only in lovely bite size pieces Dental care is unfortunately one of the most overlooked health issues pet owners are concerned with. As in humans, plaque bacteria constantly form in the mouth of all cats and dogs. Once plaque has calcified into tartar it can no longer be brushed off with a toothbrush. In many cases it has to be removed by a vet, using ultrasound and anaesthetic. If tartar build-up is left untreated it can result in bad breath, gum disease, tooth decay and premature tooth loss. EASY TO USE ONE DOSE WORMER FOR CATS AND KITTENS SUITABLE FOR KITTENS OVER 6 WEEKS OF AGE FILM COATED FOR EASY DIGESTION KILLS ROUNDWORMS AND TAPEWORMS ONE DOSE TREATMENT DOSAGE CATS & KITTENS WEIGHT 1 – 2KG ( 2.2LB – 4.4LB) = ½ TABLET 2 KG – 4KG ( 4.4LB-8.8LB) = 1 TABLET 4KG – 6 KG ( 8.8LB – 13.2LB) 1 ½ TABLETS 6 KG ( 13.2 LB) = 2 TABLETS PLEASE READ INSTRUCTIONS BEFORE USE. Beaphar Salmon Oil for Dog and Cats For Healthy Skin Condition 425ml Natural Posted today if paid before 1PM Beaphar Salmon Oil is a delicious natural supplement suitable for dogs and cats, derived from sustainable fisheries. It is naturally rich in omega 6 and omega 3 oils, which means it is a good source of essential fatty acids like EPA and DHA. The health benefits of such nutrients are widely recognised. We particularly recommend its regular use to help your pet maintain a healthy skin condition, free from itchy, flaky patches. It will also help your pet naturally develop a thick, lustrous coat. Some pet owners find it a good way of increasing the palatability of their pet's normal dry food. How to Use: Feeding advice (per day): Small Dogs: 7.5 ml (1 dessert spoonful), Medium dogs: 10 ml, Large dogs: 15 ml. Pour over usual meal. Nutri-Vit Plus Paste Vitamin & Mineral Supplement Cats Kittens 70g Nurish-Um Nutri-Vit Plus Paste for Cats is a high calorie tasty food supplement with Omega-3, Biotin and Taurine. Taurine is recommended for a healthy and happy cat. Nutri-Vit Plus is ideal for convalescing Cats & Kittens, suffering from loss of appetite. Beaphar Calming Spot-On for Cats ---Easy-to-use spot-on treatment for cats ---A natural way to calm your pet in stressful situations ---Product activated within 1 hour of application --- Beaphar Calming Spot On for cats naturally and effectively calms and reduces problem behaviour in cats of all breeds and ages. --- Contains Valerian extract, a herbal supplement noted for its calming properties. Due to its micro-encapsulated formulation, a single application will calm your cat for up to one week. --- Beaphar Calming Spot On can help alleviate problems such as vertical scratching on furniture, urine/scent marking in the home, excessive meowing and boisterous behaviour. 1 x Royal Canin Milk Bottle. 1 x Bottle Cap. 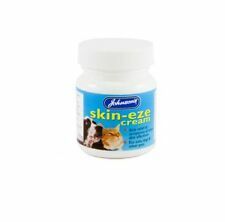 Johnsons Antibacterial Powder for Cats & Dogs 20g Posted Today if Paid Before 1pm The Johnson's Antibacterial Powder for Cats an Dogs has proven effective in treating minor wounds such as scratches, bites, scrapes and cuts. This gentle powder soothes your pet’s skin whilst the antibacterial properties of the powder help to kill bacteria, aiding in the prevention of infection and supporting the natural healing process. This product is easy to use, simply add the powder to the dressing. Johnsons Antibacterial Powder is suitable for both Cats and Dogs. Powered by [eBay Turbo Lister] (https://pages.ebay.co.uk/turbo_lister/) Other 24 Courier - UKmail next working day* If required a saturday delivery extra charge of £10 Or can be sent Royal mail 1st class signed for extra £0. Tasty and easy to give, Paw-Gel is a convenient way to reward your cat and help him stay active and vital. No petroleum jelly, wheat, corn or soy. Vetzyme Garlic Tablets For Dogs, 240 Tablets - Vitamin B Health Supplement Posted Today If Paid Before 2pm Vetzyme Tablets With Garlic 240 Tablets These tasty tablets combine the goodness of garlic with B complex vitamins derived from Brewer's Yeast. The B complex vitamins help guard against nervousness, poor coat and skin trouble, and help support the body's natural immune system. They may also help to maintain a good appetite and healthy growth, healthy eyes, mouth and throat and a healthy digestion and intestinal tract. Garlic may help to maintain a healthy heart and circulation. Key Features: - 240 Tablets - Help guard against nervousness, poor coat and skin trouble, and help support the body's natural immune system. Beaphar WORMclear® for cats kills roundworms and tapeworms. 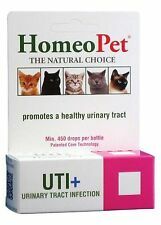 It can be used on cats and kittens from 6 weeks of age and is effective in one simple dose. Kittens should be treated every 14 days until 2-3 weeks after weaning. To remain worm free adult cats should be treated every 3 months and any sources of re-infestation such as fleas or mice should be removed. 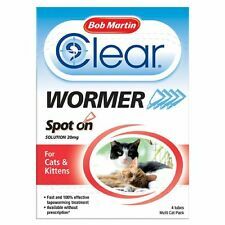 Beaphar WORMclear for cats is an authorised veterinary product. Use medicines responsibly: noah Read the enclosed leaflet before use. To ensure administration of a correct dose, bodyweight should be determined as accurately as possible.For oral administration only. The tablet should be given directly to the cat, but if necessary can be disguised in food. Weigh the cat carefully and use this table for the correct dose rate. 1 tablet per 4kg body weight. When used regularly, Laxatone coats swallowed hair with a lubricant for easy digestion. We know you are anxious to receive your stuff. This is prohibited by law. We know you are excited to receive your stuff. Johnsons Hairball Remedy 50g - Posted Today if Paid Before 1pm TASTY AID TO HELP ELIMINATE AND PREVENT HAIRBALLS IN CATS AND KITTENS OVER THE AGE OF 4 WEEKS Powered by [eBay Turbo Lister] (https://pages.ebay.co.uk/turbo_lister/). Virbac Epi-Otic Ear Cleaner is a veterinary ear cleanser designed to remove crusts, dirt and scales and to dry the ear canal which can be used for routine ear cleaning in dogs and cats. Shake well before use. 100% ALL NATURAL INGREDIENTS Made with real chicken or natural salmon protein, Feline Greenies PILL POCKETS Treats are a nutritious and healthier alternative to the commonly used human foods (cheese, tuna, etc. ), as they contain fewer calories and less fat and sodium. All NaturVet products are veterinarian formulated and manufactured in the USA in an FDA audited, CcGMP compliant facility. Pumpkin adds natural fiber to help support a healthy digestive system. We know you are anxious to receive your stuff. Cats need a balance of fibers to help minimize the formation of hairballs in their digestive tract. These smart treats are not indulgent empty calories. Smartbites Treats contain natural ingredients that provide real health benefits. Beaphar Multiwormer For Cats 12 Tablets ---Beaphar Multi Wormer Cats is for the treatment for roundworms and tapeworms in cats over 6 months old. 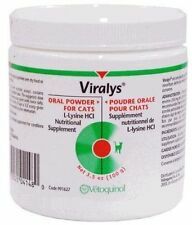 ---Contains 2 types of tablets: one against roundworms and the other against tapeworms, given over a three week period. ---Tablets may be taken whole or crushed and sprinkled into the cat’s food. UK authorised veterinary medicinal product. ---Directions for use: ---The treatment consists of three doses given at weekly intervals. Tablets may be taken whole or crushed and mixed into the cat’s food. If your cat dislikes tablets, be sure to use a strong-smelling food, such as a piece of cheese, to mask the tablets. ---FIRST DOSE: Give the appropriate number of PINK tablets (for roundworm) for the cat’s weight, as shown below. Provides appetite stimulation. Highly palatable. This is prohibited by law. USEFUL LINKS. Calcium, Manganese, Iodine, Potassium, Iron, Folic Acid, Riboflavin. We know you are excited to receive your stuff. Oral health issues are the most common health problems diagnosed in adult pets. They have a unique shape and crunchy texture that's proven to reduce tartar. Plus, with an irresistible taste, they are sure to stir up purrs of joy. All raw materials utilized in Pet Naturals products are of the highest quality and are evaluated for purity and potency prior to use. The potencies of Pet Naturals' products are scientifically formulated to help pets enjoy optimal health and wellness. Cats will love the palatable chicken liver flavor. One bag equates to one tube of Laxatone gel. Dogs Cats Small animals Horses Reptiles Fishes Birds. Small Animals. This is prohibited by law. We know you are anxious to receive your stuff. Treat and bond with your cat while providing essential health benefits. Feline Greenies Smartbites Healthy Skin & Fur Cat Treats are not indulgent, empty calories. This delicious, dual-textured treat contains natural ingredients to nourish your cat's skin and help maintain healthy fur. Facts: Total Microorganisms – 100CFU/20 mg’s (Bacillus coagulans). Bacillus coagulans – 20 mg. ARK NATURALS - Gentle Digest for Dogs and Cats - 120 Soft Chews. Serving Size: 2 Soft Chews. Gentle Digest™ contains prebiotics and probiotics. Contains natural oils and lubricants that supports normal shedding in cats of all ages to help reduce hairballs. Apply 1/4 teaspoon of Paw-Get to your cat's paw once or twice daily. Made by Vets craved by pets. Sentry HC Petromalt Malt Flavored Hairball, 4-ounce. Vet's Best Dog Dental Care Gel Toothpaste (3.5 oz) is the natural way to better oral care. Vet's Best Dental Care Gel for Dogs fights tartar and plaque to help support healthy gums, teeth, and freshen your dog's breath. Adizone-C - Natural Organic Anti-Inflammatory 4 Cats Pain Relief 1 oz. Ascenta Feline Omega-3 for Cats Supplement 4.7 fl. oz. 4-Pack 18.8 fl. oz. Catizol - Natural Organic Herbal Pain Relief Supplement 4 Cats - 1 oz.